Upfront disclaimer: I received a free sample for purposes of sharing my honest review. We at All Thumbs Reviews are all about choices. Different features for different budgets. A couple of months ago we reviewed and held a giveaway for these. Today we bring you another option for resolving the problem of tangled earphone cords, ALSO with a giveaway. Because we have awesome readers, we get to have awesome giveaways. Today's featured product is chicBuds, and for a several weeks I've had so much fun trying them out and showing them off at the gym. Shall I speak first about form or function? Is it better to look mahvelous or to work mahvelous? A pair of chicBuds is supposed to come with a fastening clip so that the cord doesn't bounce while you're be-bopping around (mine came without the clip and the medallion does bounce around some, but chicBuds has offered to remedy this and send me a new one). 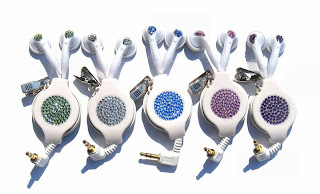 As for form, a pair of chicBuds comes encrusted with nearly 100 Swarovski crystals. And there are CHOICES. Black or white background combined with 5 jewel colors, several designer options and limited edition options, and a men's RockBuds series. The price range is $32 to $53. Surprise -- I went with the purple ("grape"). Because you read All Thumbs Reviews, you are eligible to enter in the Blog Reader’s chicBud Giveaway. To do so, subscribe to the chicBud newsletter. When asked how you heard about chicBuds, simply enter http://allthumbsreviews.blogspot.com in the website box. You will need to give up some personal information here, so decide if it's worth it to you. You will be entered into a drawing that will be picked at the end of each month. If your name is drawn you will win your own pair of chicBuds ($50 value). Each month the winners will be announced on Twitter and also will be contacted directly. Here's an added bonus if you DON'T want to give up your info, but if you'd still like to get a good deal on chicBuds: if you purchase chicBuds online, save $5 with the special code chicBuds5. The ladies at chicBuds also invite the Tweeters among you to follow them: @chicblvd and @chicbuds. Thumbs up on my chicBuds. Sound good to you? Want easy access to products recommended by Lori and Chicklet? Help support us by visiting the All Thumbs Store, which has no added markup. Just easy shopping, good prices, Amazon security and thumbs up ratings. Those are really cool! I entered the contest. Swarovski crystals - I would buy these and I am not a lady. Super cute!! I will add your button to my side bar, also become an official follower. I need to go enter the giveaway. Thanks, Ladies! So are they the type that goes into the ear canal, or the kind that are large round things that sit just inside the shelf of your ear? I don't have luck with the large round things because they are too big, I'd rather have the kind that sit in my ear canal. I'll have to go check them out and see if they provide more details. wow what a great giveaway, count me in. I'm a chicBud newsletter subscriber! These are so cute! I entered their contest and signed up for their newsletter. Great giveaway. I signed up. This is a personal blog written and edited by Lori and others. For questions about this blog, please contact us by leaving a comment on any post. This blog accepts forms of cash advertising, sponsorship, paid insertions or other forms of compensation. Sponsored posts are clearly marked on this blog and in our Twitter, Facebook, Google+ and other social media streams. Not every post is a sponsored post. This blog abides by word of mouth marketing standards. We believe in honesty of relationship, opinion and identity. The compensation received may influence the advertising content, topics or posts made in this blog. We may be compensated to provide opinion on products, services, websites and various other topics. Even though we may receive compensation for the posts or advertisements, we always give our honest opinions, findings, beliefs, or experiences on those topics or products. The views and opinions expressed on this blog are purely our own. Any product claim, statistic, quote or other representation about a product or service should be verified with the manufacturer, provider or party in question. This blog does not contain any content which might present a conflict of interest. Effective May 8, 2008, in perpetuity. (c) 2007 All Thumbs Reviews. The contents of this website are protected by applicable copyright laws. All rights are reserved by the author.